Firstly, it was the birthday of Hudson Fysh (1895), one of the founders and managing director of the nation’s official airline – QANTAS. Fysh was born in Launceston, TAS and died in the Sydney suburb of Paddington in 1974. The Sydney Morning Herald included Fysh in the list of “100 most influential Australians of the century” and in 2008 a Qantas A380 was named after him. The first trans-Tasman solo flight also took place on this day (1931). 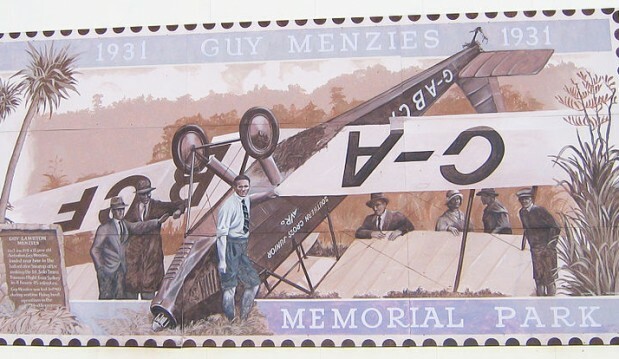 Guy Menzies left Sydney at 1am on that day, pretending to fly to Perth, but headed to Blenheim in the North of New Zealand’s South Island instead. Due to inclement weather he ended up in Hari Hari near the Franz Josef Glacier on the West Coast 11 hours and 45 minutes later. Mistaking a swamp for a paddock he crash landed his plane, but remained unharmed. Nevertheless, he not only completed the first solo flight across the Tasman Sea, he also set a new flight time record, beating the time achieved by Charles Kingsford Smith (after whom Sydney airport has been named) and his co-pilot Charles Ulm in 1928 by more than 2 hours.